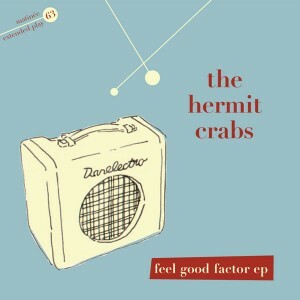 Impressive debut single from very promising new Glasgow act The Hermit Crabs. Band members Melanie Whittle and Des McKenna are veterans of Scottish favorites California Snow Story, while John Ferguson and Tony McDonald complete the current lineup. Lead track ‘Feel Good Factor’ is rich with instrumentation and simply spectacular... the sort of song that comes along only once in awhile but sticks with you forever. The track is one of the winners in Scotland’s Burnsong song writing competition so prepare for something truly remarkable. The EP also features ace exclusive songs ‘China Girl,’ ‘Vegan Vows’ and ‘I Spend My Time’ - three more top quality tracks featuring violin, classical guitar, keyboards, superb vocals and strong lyrics. Perfect for fans of Camera Obscura, Tender Trap, Belle and Sebastian or Sambassadeur, the Hermit Crabs are a very welcome addition to the Matinée roster. The band is currently working on its debut album for release in 2007. Listening to this EP faced me with the difficult task of trying to suppress four years of blind worship to the Alter of Ms Tracey-Anne Campbell. Let’s face it, comparisons are lazy and unfair, but soft female vocals lulled over some mid-tempo Glaswegian twee inevitably meant any mention of The Hermit Crabs was always going to be quickly followed by one of ‘Camera Obscura’. But that aside, the Feel Good Factor EP does try to delve beneath obvious influences carving out a more individual sound for itself. Apart from ‘Feel Good Factor’ which not only creates the most disgustingly farfetched and wholly untruthful picture of Glasgow (“I wanna see those faces the glorious sight/oh the glorious people of Sauchiehall Street”), but easily sounds the most like CO. The rest of the tracks have the stamp of the ‘Crabs own personality; an essence of an overbearing glumness in Melanie Whittle’s vocals; a delicate sadness, but one which is counteracted by pretty harmonies, a gentle piano piece, sweet recorders or a wavering violin. Their personality is probably best expressed in ‘I Spend My Time’, which falls in-between an upbeat light twee and an eerie discord, and as the last track on the EP definitely shows they’ve got legs of their own to carry on with, or at least pincers… --Is This Music?